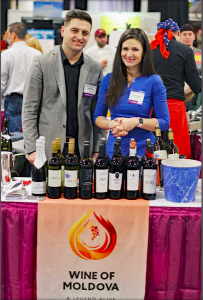 Wine of Moldova USA was founded in 2014 and is dedicated to fleshing out undiscovered and exceptional wines that demonstrate the highest quality available. As a niche wine importing company, Wine of Moldova USA is focused on wines from Moldova with the intention to serve the diverse needs and wants of wine lovers. Each wine in our portfolio has been found and selected by Andrei and Daria, husband and wife, founders and owners of Wine of Moldova USA. They source wines that reflect the exceptional qualities and terroir of the territory on which they are grown. Andrei and Daria’s dedication stems from a passion for wine which Andrei inherited from his father, a winemaker in his home country, Moldova. Moldova’s millennial heritage of wine-making began around 3000 BC, and the first vines were recorded there around 7000 BC. Throughout its history, wine and vine have been deeply enrooted in the culture, myths, folklore and legends of Moldova. Even the map of the modern Republic of Moldova is shaped like a bunch of grapes. The white stork, the protagonist of many local legends, is the symbol of the Moldovan wine industry, as well as the symbol of the continuous revival of the country. Moldova has three vine growing regions with three protected geographical indications for wine – “Valul lui Traian”, “Stefan Voda”, “Codru” – and a special geographical denomination for grape distillates – “Divin”. Some of Moldova’s main attractions also serve as evidence of Moldova being a true wine country. Moldova is in the Guinness Book of Records for the biggest wine collection in the world, consisting of almost 2 million bottles, stored in Gothic-style cases at a depth of 80 meters in the underground wine galleries of Milestii Mici. Moldova is also home to the largest wine cellars in the world. One of them is the underground wine city Cricova, with tunnels stretching for 80 miles at a depth of 300 feet underground. The National Vinotheque is an outstanding collection of legendary wines also kept in the Cricova cellars. The oldest wine in the collection and the only bottle if its kind in the world, is the wine Easter Jerusalem, which was produced in just one batch in 1902. Today Moldova has the largest density of vineyards in the world. Some of its most popular indigenous varieties are Rara Neagra (Rare Black), Feteasca Neagra (Black Maiden), Feteasca Alba (White Maiden), and Feteasca Regala (Royal Maiden). The international varieties wines however are also of a unique terroir and style, which make them worthy of your attention.